Q. What's the fastest way to improve your swimming speed? A. Better turns and pushoffs. 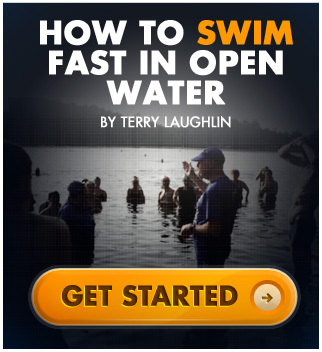 1.Streamline to travel farther and faster underwater. Cover each lap in fewer strokes. 2. Balance so your kick propels you forward, instead of fixing body position. Save air and energy. 3.Move forward, not up, through the surface. Start stroking with easy speed. 1. Change directions in a narrow plane. Head, shoulders and legs follow one line in and out. 2. Tuck tightly. Change directions at maximum speed and minimum effort. 3. Be balanced on foot-strike. More power from your leg and a better line to the surface. Ã¢â‚¬Å“Turn the TI WayÃ¢â‚¬Â will teach you those skills in five step-by-step lessons. *Push off at optimal depth. *Convert underwater speed to surface speed. *Release the wall and sit back. *Bring hands, from different positions, to streamline. *Minimize drag as you rotate to your side. *Approach the wall with speed and momentum. *In and out on the same line. *Position legs and feet to max pushoff power. *Initiate your turn more smoothly. *Get extra air before and after the turn. *Improve pushoff alignment and distance.